Prince Hamlet, home from the University of Wittenberg for his father’s funeral, is horrified by the swift remarriage of his mother (Charlayne Woodard) to Claudius (Ritchie Coster), Hamlet’s paternal uncle. The prince’s world turns upside down when the restless ghost of his father materializes, confiding that his death was regicide. And biggest news of all: Uncle Claudius, who has inherited the throne of Denmark from his dead brother, is the killer. 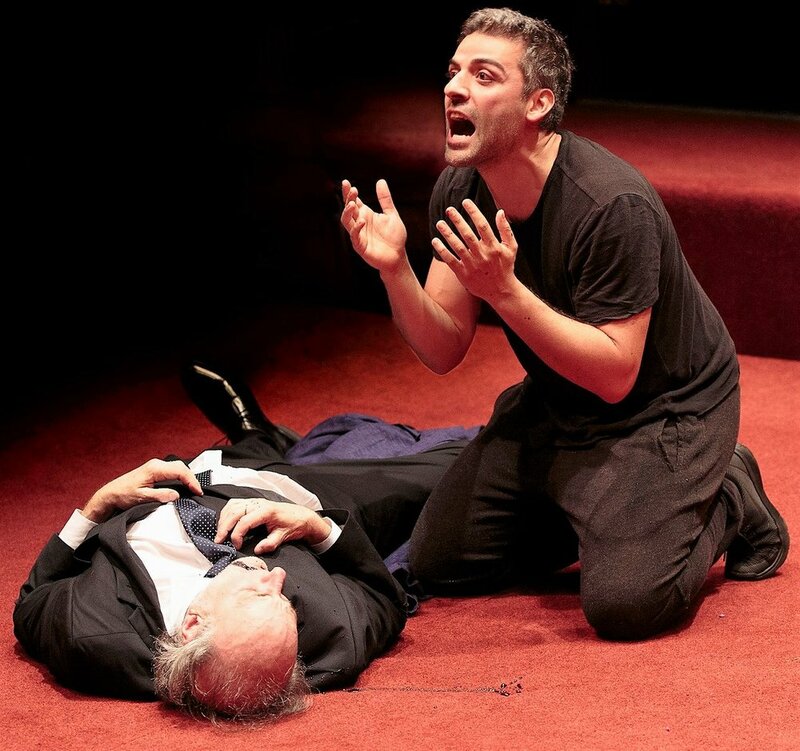 Oscar Isaac as Hamlet and Roberta Colindrez as Rosencrantz in "Hamlet" at the Public Theater. Top (clockwise): Isaac, Charlayne Woodard as Gertrude, Ritchie Coster as Claudius, Keegan-Michael Key as Horatio, and Matthew Saldivar as Guildenstern. Photographs by Carol Rosegg. Ordered by his phantom father to avenge the murder, Hamlet procrastinates. He keens with grief, fumes about his mother’s unseemly nuptials, and ponders mortality and that “undiscovered country from whose bourn / no traveler returns.” He masks his fury and vengeful intentions with an “antic disposition,” leading those around him to think he’s crazy. With more than 25 characters, Hamlet is a gargantuan play—Shakespeare’s longest and, arguably, his most intellectually complex. Gold has chosen to stage it with a cast of only nine, so all of the actors except Isaac shoulder two or more roles. As in Gold’s recent Broadway staging of The Glass Menagerie, the physical environment of this Hamlet suggests a rehearsal space. That approach, presumably intended to emphasize what’s universal in the text, discourages the audience from engaging with the performance on a level that’s more emotional than intellectual. Gold and scenic designer David Zinn have created a less than royal Kingdom of Denmark. The playing area is covered with a garishly red indoor-outdoor carpet. The set is furnished with a roughed-up folding table and some strictly utilitarian chairs. There’s a “throne,” but it’s an industrial-grade toilet. Gold is working with a top-notch cast. Isaac, known to a wide audience as Poe Dameron in the Star Wars movie franchise, is a bit mature to be a Wittenberg undergraduate, but he’s still an effective juvenile lead. Isaac handles the Bard’s blank verse with skill and vocal assurance, and he makes Hamlet’s feigned madness at once poignant and funny, and his procrastination credible. Isaac, as Hamlet, feigning an "antic disposition." Gold’s decisions with respect to doubling are interesting but spectators not familiar with the intricate plot are likely to be perplexed. Few of the actors change clothes in the course of the performance, and designer Kaye Voyce’s contemporary costumes, which may have come from a thrift shop, do little to convey character. Peter Friedman, superb as blowhard Polonius, and Gayle Rankin, the idiosyncratic but arresting Ophelia, rise from a mound of soil and raggedy flowers immediately after their death and burial scenes for duty, respectively, as the comic Gravedigger and his companion. This is an inspired twist, with the two transforming themselves instantly through actorly technique alone. But not all the innovations of this production are equally effective. Justly celebrated for his collaboration with playwright Annie Baker on new works, Gold has been known to cloud older texts, such as Osborne’s Look Back in Anger and Stoppard’s The Real Thing, with extratextual preciousness that’s more distracting than enlightening. At the heart of Gold’s overall conceit for this production is his use of Coster in three roles: Hamlet’s usurping uncle Claudius, the vengeful ghost of his father, and the Player King in the play-within-a-play with which Hamlet endeavors to “catch the conscience of a king.” Thus the focus of this Hamlet is the familial psychology of the prince’s story, including the notion that he (who can’t be certain when his mother began her affair with Claudius) can’t be certain whether he was fathered, in biological terms, by the dead king or by Claudius. Though intriguing, this approach sits on the thin line between insight and pretentiousness. Hamlet immediately after the killing of Polonius (Peter Friedman). Gold’s use of Coster as both kings permits him to close the production with a provocative tableau emphasizing the domestic root of Denmark’s rottenness: wronged father and murderous uncle (both represented by Coster), hypersexual mother (the poised and powerful Woodard), and Isaac’s troubled prince, upright like statutes, caught in an eerie light, and locked in an eternal, four-way embrace. That final image is a contrast, which some may find refreshing, to the corpse-strewn conclusion of customary Hamlet productions. But the important news is that none of Gold’s cheeky innovations get in the way of his fine actors performing this familiar yet ever-challenging Shakespearean text with urgency, clarity, and insight. Hamlet plays through Sept. 3 at the Public at Theater (425 Lafayette St.). Evening performances are at 7 p.m. Tuesday through Saturday; matinees are at 1 p.m. Sunday, with added performances at 1 p.m. on July 22, Aug. 5, Aug. 12, Aug. 26, and Sept. 2. For tickets, call (212) 967-7555 or visit www.publictheater.org.